The findings of an online survey shows that Christchurch’s shared electric scooter service is winning fans across the city. American bike and scooter share company Lime has been operating its electric scooters in Christchurch on a trial basis since October 2018. More than 400,000 scooter trips have been taken in the city during the first three months of the trial, with more than 100,000 people taking at least one ride. Christchurch City Council conducted an opt-in online survey at the end of last year, as part of its assessment of the trial to find out what people thought about the shared scooters and to gather information about how they were being used. About 8000 people took part in the survey. Just over half of respondents had tried a shared scooter. Council Transport Operations Manager Steffan Thomas says the survey findings show that three-quarters of respondents feel the e-scooter trial has had a positive or very positive effect on the city, with Lime e-scooter users much more positive at 93 per cent than non-users at 58 per cent. “People using the scooters most commonly said they were using them for trips where they otherwise might have walked, but nearly a quarter of all scooter trips appear to be replacing vehicle trips," Mr Thomas says. “While the e-scooters are being commonly used for fun and recreation, people are also using them for trips to cafes, restaurants and social occasions." 70 percent of respondents say they feel that most or all Lime e-scooter users are using them in a safe and responsible manner when quizzed on the subject of scooter safety. Again, Lime e-scooter users were more likely to say this (85 per cent) than non-users (56 per cent). “Lots of people are encountering people riding e-scooters on footpaths on a regular basis. 62 percent of survey respondents reported feeling fairly or very safe when asked about sharing footpaths and other public spaces with e-scooters" Mr Thomas says. “People that hadn’t used an e-scooter before were much more likely to feel unsafe, with 55 percent reporting that they felt a bit unsafe and 23 percent very unsafe." Most respondents (74 percent) think shared e-scooters should stay in Christchurch after the trial, with users much more likely to want this (93 percent) than non-users (56 percent). Mr Thomas says key findings from the survey will be included in a report that Council staff are preparing for the 13 February meeting of the Infrastructure, Transport and Environment Committee. Other information gathered during the trial will also form part of the report. 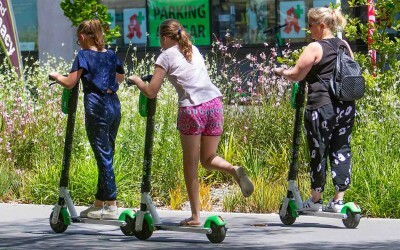 The report will include a recommendation from Council staff on whether Lime, and potentially other e-scooter share companies, should be allowed to continue operating in Christchurch.